Just because you do not eat gluten does not mean you cannot eat one of the world’s greatest foods- Pizza! Crisp and chewy, this Easy Gluten Free Pizza Crust is a wonderful base for all your favorite toppings. 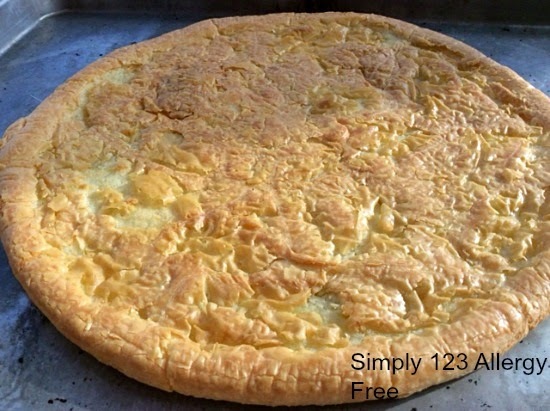 This recipe makes two 10 inch pies and is perfect for two to three people. For easy weeknight meals, make a double recipe of the baked crusts and freeze some to top when you need them next time. 3/4 cup gluten free all purpose flour mix Note: I used the Bob's Red Mill brand. 2 packet active dry yeast Note: I like the Fleischmann's brand. This is not bread machine or cake yeast. Place all dry ingredients in a large mixing bowl and whisk until thoroughly mixed together. Add honey, vinegar, olive oil and gradually add water. Mix on high speed for 3 to 4 minutes. Note: you must use a stand mixer or electric hand mixer to make this dough; mixing by hand does not do a thorough enough job. Scrape the thick dough on to parchment paper on your work surface, liberally sprinkling with tapioca flour. Work enough tapioca flour into the dough so that it can be shaped into a large ball. With a large knife cut the dough in half to make two medium pizzas. Shape each piece into a circle making sure to sprinkle enough tapioca flour on the dough and the parchment paper to prevent it from sticking. Carefully transfer parchment (with dough) onto a baking sheet and place on top of preheating oven for 10-15 minutes, no longer as you are not looking for a rise like you would from a loaf of yeast bread, so do not expect significant changes to the dough. Bake crust 8-10 minutes, remove from oven, add sauce and desired toppings and dairy free cheese, and return to oven to melt cheese and heat toppings, baking an additional 7-10 minutes, or until bubbly. Another option is to cool par baked crusts, wrap and freeze for convenience and use at a later time. Thanks for posting this. Pizza is one of those things that I still drool over even though I've gone gluten free (hashimoto's). Delicious gluten free pizza, thanks for sharing with Hearth and soul blog hop, pinning.